Kimchi is one of those things that seems so exotic but is so ridiculously easy to make at home — and fresh, homemade kimchi is infinitely better tasting than anything you can buy from the market. If you’ve never had this fermented side dish, think of it like a spicy Korean version of sauerkraut. The smoke and fire comes from gochugaru, a Korean red pepper powder (sometimes also called Korean chile flakes or Korean chili powder, but definitely not to be confused with American red pepper flakes or American chili powder). 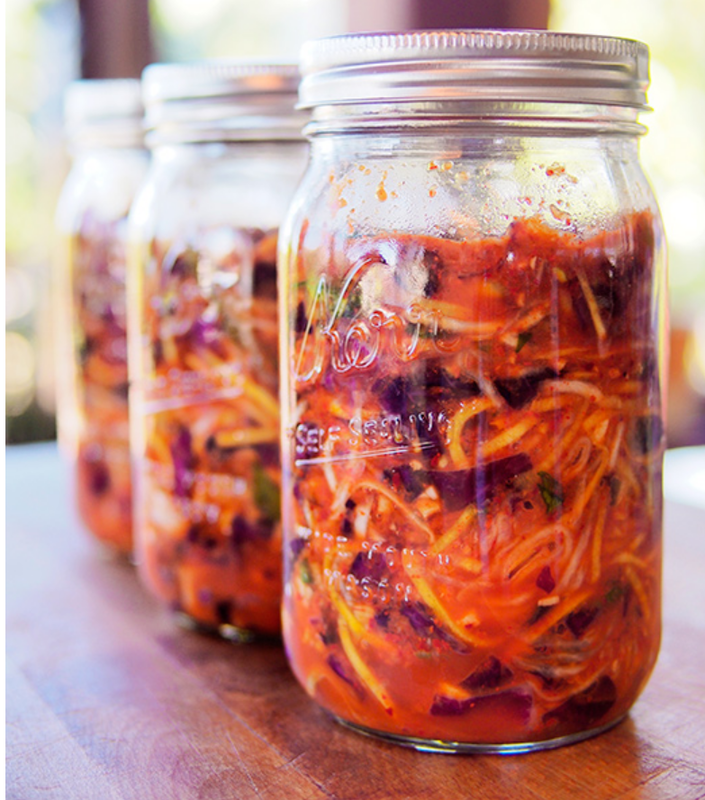 Similar to kraut, kimchi is full of probiotic goodness and it’s not solely limited to Korean dishes. I’ve made kimchi omelets, kimchi quesadillas, kimchi pizza, and even spooned a heaping of kimchi on a baked potato. This version is a medium spicy that won’t burn your tongue off, but still has enough heat and tang to make a meal interesting. Red cabbage tends to be a tad tougher than napa cabbage, so I chop mine into thin, bite-sized pieces.